The audience I watched this movie with remained in stony silence until the final, uninspiring end. So the producers calling it a comedy is a definite over-reach. Unfortunately, without any humor, this is just an unremarkable story, about an unremarkable man, who lives an unremarkable life. 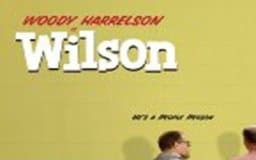 Wilson (Woody Harrelson) has one friend, and when this friend moves to another state, he is left with only his dog for company. Just a few days later, Wilson’s father dies and, in crisis mode, he contacts his estranged wife, Pippy (Laura Dern). When they meet, Pippy informs him she gave birth to a daughter (Isabella Amara) after they separated. Wilson is thrilled and persuades Pippy to help him find the child that she gave up for adoption 17 years before. When Wilson’s friend breaks it to him that he’s moving away, Wilson’s attempt to guilt-trip him is high-jacked by the friend’s wife, who tells Wilson he’ll now have to make an effort to meet new people. However, whenever we see Wilson with strangers, he does in fact attempt to interact, but his behavior gets him rebuffed. Had the friend’s wife given Wilson some sage advice on how to successfully socialize, the audience would have silently agreed and become active participants in the story, rooting for the hero to change. Unfortunately, however, Wilson’s character flaw is left largely unchallenged, so he simply drifts along with no personal goal or long-term plan of action. Yes, he wants his wife back, and yes, he wants to meet his daughter, but these goals are accomplished with amazing ease, in super-quick screen time. After this, the family of three simply hang out and exchange unsurprising dialogue, with one humdrum event rolling into the next. Things do go wrong, but not because Wilson makes bad choices or does anything else decisive. And when his life finally crashes (as all movies have to at the end of act two), it’s again due to other people’s actions, not his own. Despite the general ‘down’ theme, the filmmakers decided to give it an ‘up’ ending, which the audience is in dire need of after enduring such a pedestrian tale. However, Wilson is still the same passive misfit we met at the beginning, so any stroke of good fortune has to be arranged for him. This hardly makes for an inspiring protagonist, but unfortunately we can’t all be heroes. Someone’s got to sit on the sidewalk and clap. Based on the novel by Daniel Clowes.